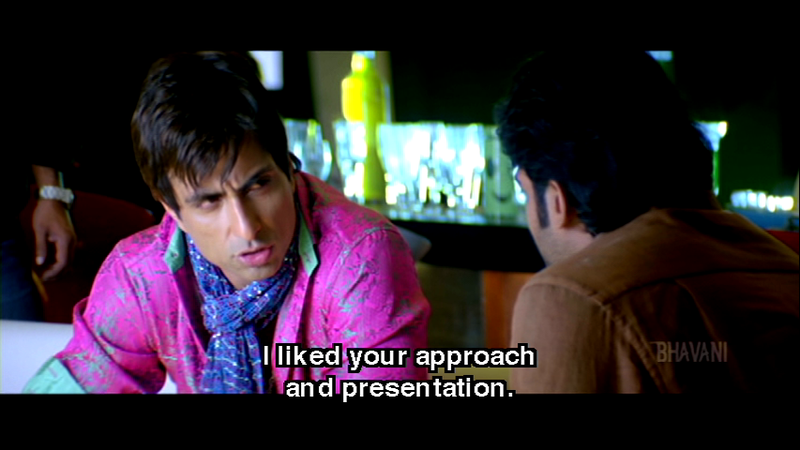 We did say it is silly season here and what could be sillier than Sonu Sood’s wardrobe in this film? Exactly. 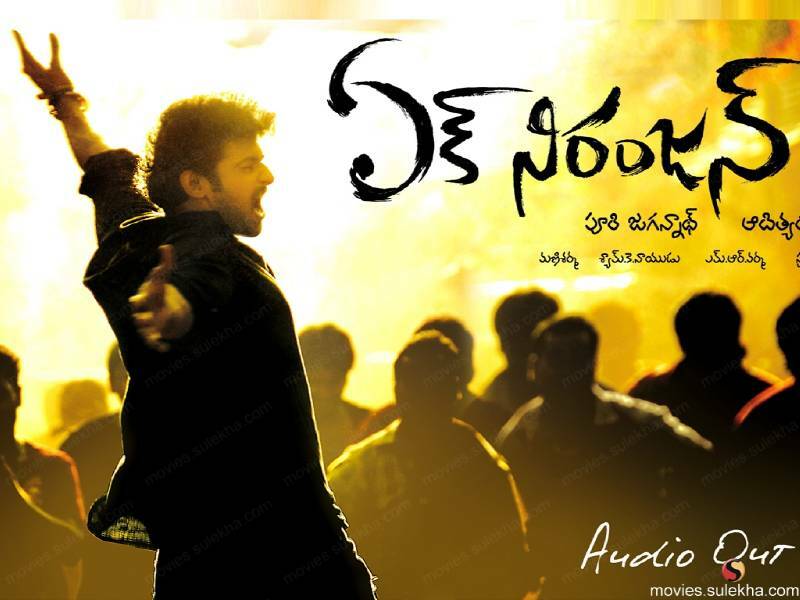 Ek Niranjan is a typical good guys versus bad guys effort from Prabhas and Puri Jagannadh who teamed up previously in the almost equally silly Bujjigadu. Kangana Ranaut supports in a surprisingly conventional heroine role, and Sonu Sood makes a splash in his familiar quirky villainous avatar. The story is simple enough in a convoluted way. But really, the power behind this film was firmly in the hands of the departments of dress and dance. We suspect they wrote the screenplay too. Prabhas is Chotu, stolen from his parents as a baby by a local wild-haired Fagin like figure, Chidambaram (played by Makrand Deshpande who is familiar to us from Swades). Chotu spends his whole life trying to find his family, and keeps in touch with Chidambaram, who is now in jail. Chidambaram, dodgy mentor and dubious father figure, often says God plays kabadi or chess with people’s lives but he seems to have a fair go at playing kabadi with Chotu’s life himself. Chotu makes a living as a bounty hunter. He is a thug on the side of the law, and probably more morally upright than many of those in uniform. His rowdy bashing brings him into contact with local thug Jani. 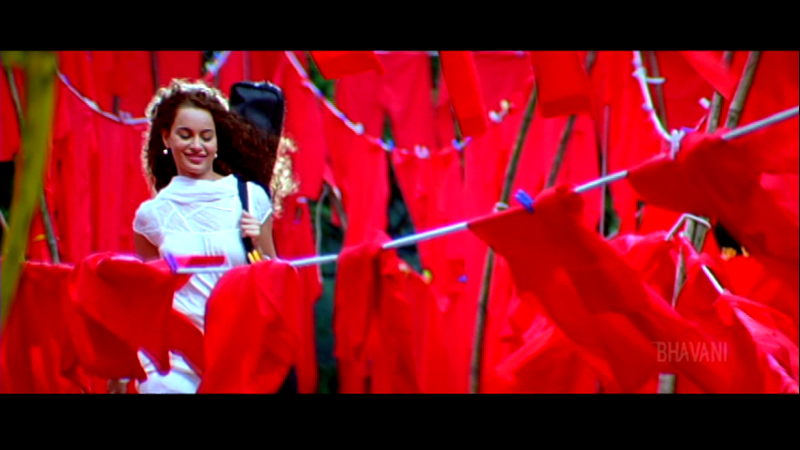 Kangana is the local guitar teacher, whose brother is in the gang headed by Jani Bhai. Her neighbours happen to be Prabhas’ long lost parents and also the parents of Kailash, a killer in Jani‘s gang (yes, that does make him Chotu’s brother so you can see where this might be heading). She is a standard film heroine – not much to do but run after the hero and away from the bad guys once she sorts out who is who. We kept waiting for her more usual persona with the drugs and tortured psyche to turn up, but the most tortured thing about her were the hotpants. Kangana’s character started off quite promisingly, if unbelievably, as a guitar teacher but was quickly relegated to the sidelines. It’s obvious (to us) why Jani feels he doesn’t get the respect he is due. Brahmanandam and Ali take care of the separate comedy side plot, and it’s not their finest work. Brahmi is a guru married to a young and lovely woman and Ali is his Captain Jack Sparrow inspired rival. There is a small comedy track with Venu Madhav as the loser enamoured of Sameera who gets beaten up by a horde of angry ladies wielding snake beans . 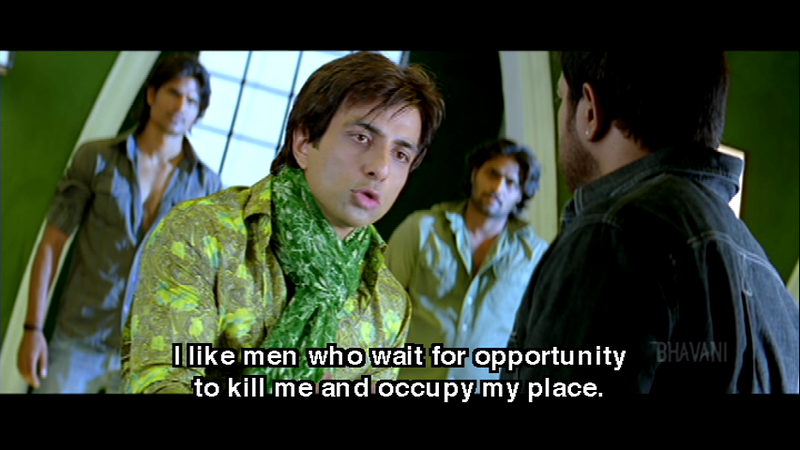 And another unnecessary comedy track involving Sunil and the ladies of Bangkok. None of these scenes make any sense and don’t add anything to the story, having the opposite effect of distracting us instead. There is all the usual confusion and heavy-handed signalling of things to come. Prabhas and his parents cross paths over and over. They talk, they share food, and they know each other as neighbours. This was probably supposed to be tantalising in the ‘will they or won’t they recognise each other’ arc, but really didn’t create any sense of urgency or tension. Veeraiah (Tanikella Bharani) and his wife (Sangeeta) are really just there as something for Chotu to miss and allow Prabhas more excuses to perfect his sad puppy look. More could have been made of the contrast between the two brothers, one who grew up with loving parents but turned to a life of crime, and the other who grew up in a gang of beggars and thieves but ended up fighting crime. There is lots of predictable action: running, fighting and crying (Prabhas), running, crying and squealing (Kangana), and drinking, whinging and rampaging (Sonu). There are multiple double-crosses and switches of allegiance in the course of the story but throughout it all, Chotu is the hero and always does what is more or less right, a bit of slapping excepted. His enemies are all bad guys – they deserve what’s coming to them! The climax of the film is set in Bangkok, as all the characters are beset by coincidence and end up there for no apparent reason. It includes a really peculiar tribute to Michael Jackson, starring Erina (that item girl from Arya 2). It’s refreshing to see people missing MJ for the great artist he was rather than focussing on all the weirdness, despite the somewhat odd placement of the song and its lack of connection to anything else in the film. Finally, Jani gets his comeuppance, thanks partly to long suffering Brahmaji (Brahmaji) and everyone goes home to continue the great divine kabadi match. The supporting performers, and there are possibly too many of them, do what they have done so many times over. Tanikella Bharani is wasted in his role as he is at best a background presence. Posani Krishna Murali is an uninhibited and unhinged politician with a murderous intent and an equally strong fear of being caught, and outdoes Sonu Sood in scenery chewing. Makrand Deshpande manages to make Chidambaram memorable and imbues the drunken conman with a level of pathos and complexity this film didn’t really deserve. Prabhas wasn’t granted any immunity from crimes of fashion, switching from jeans & solid colour shirts to the more exotic in the blink of an eye. 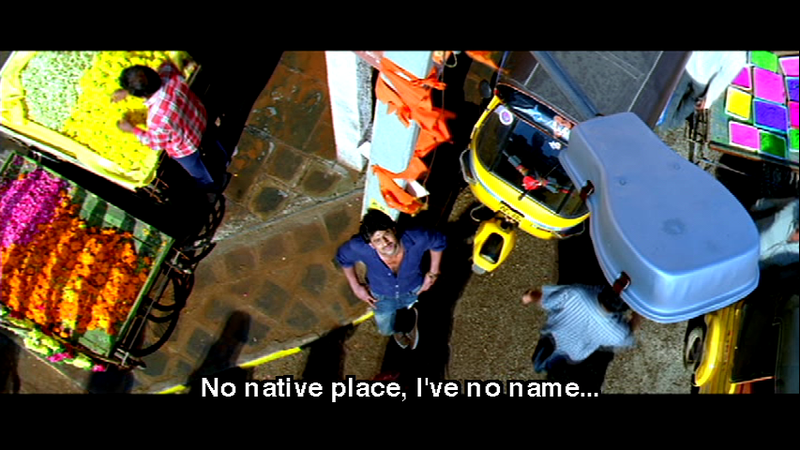 The Mani Sharma soundtrack isn’t particularly memorable, and does borrow heavily from western songs. Choreography by Pradeep Anthony seems to be designed to show Prahbas in the best possible light, so is rather hilarious on occasion, possibly intentionally. Maybe not. We are particularly delighted by how lame this one looks – is there any cliché from the 80s that they missed? A suitably silly offering for the festive season. Temple says: This is just daft from beginning to end. Entertaining, but really daft. The story is improbable, which is not unusual, and the costumes are ridiculous which is also par for the course, but they go all out in their chosen direction which I find pleasing. What does set it apart from a mediocre pot-boiler are the performances which are pretty good. Prabhas is gawky and always seems slightly startled to find himself dancing away like a mad thing. I really like Kangana in this and I thought she handled the light heroine role with ease. It was nice to see her not play a character with overwhelming problems (apart from the overwhelmingly silly plot). 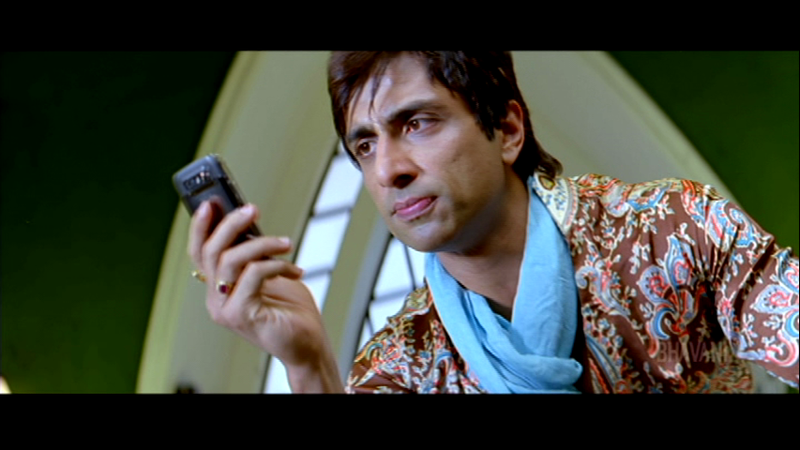 Sonu Sood pretty much reprised this role in Dabangg and I think he enjoys being a villain, although I would like a bit more serious darkness from his performances from time to time. The support cast were good but there were too many of them cluttering up the story and not really going anywhere. The plethora of comedy sidekicks was just annoying and for the most, lacking in comedy. The soundtrack is average and really, without the spectacular visuals the songs don’t hold up so well. The movie is dominated by Prabhas and Sonu Sood – I think they have a long and promising hero-bad guy future ahead of them. They’re on the same eye-level so it must make those dramatic glaring scenes a lot easier to film too as they both fit in the same frame! And please give a round of applause to the wardrobe team who made it possible for me to watch this film again and still be thoroughly entertained. I didn’t even use ALL the scarfy screencaps in the post. Imagine what you’ll discover when you watch it for yourself! This gets 3 stars from me. Heather says: This really is a very silly film! Just when you think they can’t possibly get anything more ridiculous for Jani Bhai to wear – they do! And every song just has more and more amazing moments and totally over the top choreography – I love it! There is something very endearing about Prabhas, maybe because he is just that little bit tall and looks slightly awkward. He is always entertaining to watch as he throws absolutely everything into his role, and Ek Niranjan is no exception. While Sonu Sood does go a little overboard in his villainy, Prabhas manages to keep the story in sight and delivers a credible performance. The interplay between the various gang members, the various twists and double crosses and the posturing and menace between Jani Bhai and Chotu really lifts this a bit above the usual good guys bad guys movie. I would have liked a little more focus on the hunt by Chotu for his parents and there could have been a nice contrast between the two brothers. 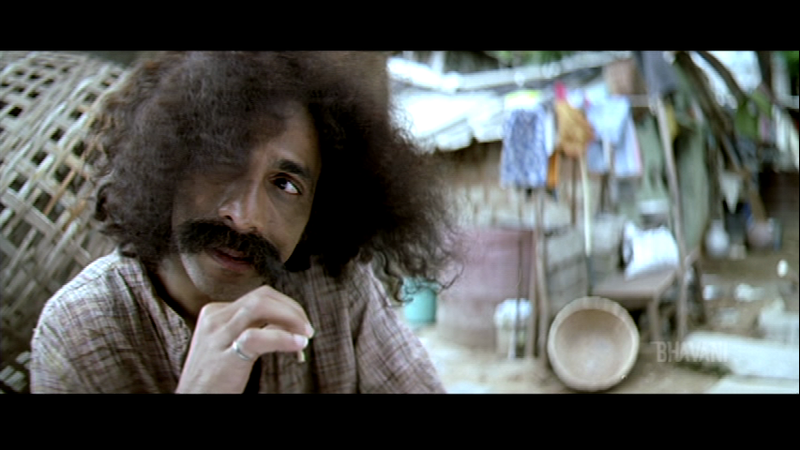 But the performance by Makrand Deshpande as Chidambaram made up for that lack as he really is excellent in his role. This entry was posted in Tollywood and tagged Ali, Brahmaji, Brahmi!, Kangana Ranaut, Makrand Deshpande, Mani Sharma, Posani Krishna Murali, Prabhas, Pradeep Anthony, Puri Jagannadh, Sangeeta, Sonu Sood, Sunil, Tanikella Bharani, Telugu, Tollywood, Venu Madhav. Bookmark the permalink.